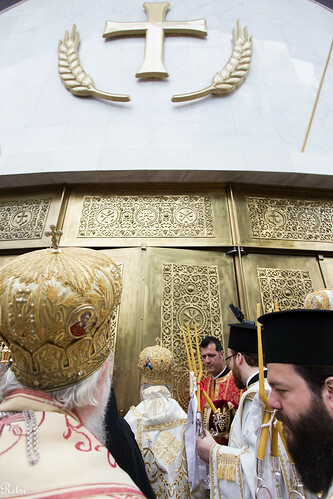 The opening of the doors of the new cathedral in Tirana is but one of many recent developments that point to an increasingly vibrant expression of Orthodox Christianity in Albania. OCMC has been involved there for many years and will continue to be in order to serve as the Church's partner in taking the Faith to all people of Albania. My first visit to Albania was in 2012. The full impact of the global economic crisis was beginning to hit hard as scores of Albanians who made their livings in Italy and Greece saw work become increasingly scarce. I was also able to get a glimpse of how the echoes of Albania’s Communist history still affected the people. Interestingly, the fear and fatalism that can run rampant in such circumstances was mitigated by the hope and thirst for meaning among many of the people I met on my visit. They were children, college students, ministry workers, clergy, and missionaries. None were delusional. They were all aware of the challenges before them. But, they also were not resigned. They saw a purpose. Over the years, the Orthodox Christian Mission Center (OCMC) has dedicated more resources to Albania than almost any other country, and they have been involved there longer than almost anywhere else in the world. I have only been with the Mission Center since 2006, but I am probably more aware of OCMC’s history and Orthodox missions in Albania than most. With that said, I was honestly prepared to go to Albania and see a mission field ready for much less intense missionary involvement. I was prepared to return with a story of a country in transition. The truth is that I did come back with a story of transition, just not the one I’d expected, and I didn’t really start appreciating this story until recently. To say that a lot has happened in Albania since my initial trip in 2012 under the leadership of His Beatitude Archbishop Anastasios would be an understatement. The new cathedral was consecrated in the heart of Tirana, the Church is active in global ecumenical dialogue, ministries are growing and serving more and more people, and the social outreach initiatives (both active and planned) are incredible. Many of these endeavors are initiated and led by the Albanian faithful themselves! Why, then, does the OCMC have eight missionaries and their families serving there - more than in any other country? Why is it sending three short-term mission teams in 2015 – as much as any other mission field? And why does it send assistance to underwrite projects being undertaken by the Archdiocese? Is all of this really necessary? Short answer…Yes! In all that it does, the Church in Albania is becoming less and less dependent on outside assistance. It has taken, and is taking, steps toward becoming self-sustaining, and there are many ministries in place aimed at empowering the Albanian people. It has a seminary to train its own clergy, it has Albanian hierarchs, it is even sending its own people into the mission field! The Orthodox Church of Albania does not “need” OCMC per se, but Albania most definitely does! According to the CIA World Fact Book, only about 17% of Albanians consider themselves Christian. There was a time, before the rise of the Ottoman Empire and the grip of Communism, that Albania was almost entirely Orthodox Christian. Far from the Church in Albania being dependent on OCMC, it has invited the Mission Center to work in partnership in order to make the Orthodox Faith available to everyone in Albania once again. This is not something that is accomplished overnight. The seeds of the Faith are sown and watered through relationships. This is the ultimate aim of OCMC’s work in a country like Albania. It is why OCMC missionaries teach at the seminary, why they have established campus ministries, why they help to translate and publish the writings of the Church and His Beatitude, and why (alongside short-term team members) they minister to women, children, and intellectuals. Each of these efforts directly witnesses to the Faith or equips others to witness to the Faith. By inviting OCMC to partner with them, the Church in Albania dramatically increases its capacity to witness. This March I will be returning to Albania, a place where the Holy Spirit is at work, blessed with new eyes and new understandings. I pray that I will return with a new articulation of the hopes the Church in Albania feels and the purpose that it sees, as well as a fresh look into the lives of the faithful from the United States who have answered the call to share the love of Christ with the Albanian people! Please continue to pray for and support Orthodox missions in Albania. More coming soon!